TOKYO, Aug 10, 2015 - (JCN Newswire) - A highway traffic management system (HTMS) delivered by Mitsubishi Heavy Industries, Ltd. (MHI) has newly gone onstream in Sri Lanka. The installation is the country's first full-scale system of its kind, and it is expected to contribute significantly to improved safety and reduced congestion on a local expressway. The HTMS was installed on Sri Lanka's Southern Expressway spanning from Colombo, the largest city in Sri Lanka, to Matara, a distance of approximately 120 kilometers (km). Construction work was performed under a grant-in-aid provided by the Japanese Government (Japan International Cooperation Agency [JICA]). Based on a package agreement concluded in November 2013 with the Sri Lankan authority placing the order - the Road Development Authority (RDA) - MHI handled all aspects from engineering, procurement and installation to adjustment and operation training. 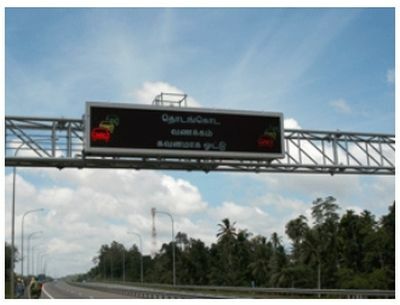 The company provided some 30 sets of full-color traffic information signboards, approximately 40 sets of vehicle detection cameras, weather sensors and other roadside equipment, as well as the central computer systems for data processing, operating status monitoring, etc. Preliminary design work and construction supervision were carried out by Oriental Consultants Co., Ltd. and East Nippon Expressway Company Limited (NEXCO East). Sri Lanka's Southern Expressway opened in November 2011 and will eventually be connected into neighboring expressways already in operation. In addition, new expressway construction is currently under way in the country in preparation for an anticipated dramatic increase in vehicle traffic in the coming years. The newly delivered HTMS is designed to provide expressway users with timely traffic information during inclement weather and when accidents occur. In this way the system will help prevent congestion and accidents caused by natural disasters, thus contributing to the realization of safe, smooth high-speed road traffic. MHI has an abundant track record both in Japan and abroad as a leading manufacturer of toll collection systems, including electronic toll collection (ETC) systems, for expressways, parking lots, etc. Today the company is applying the technologies and experience cultivated through these operations to aggressive initiatives in the field of intelligent transport systems (ITS), the social infrastructure of the next generation. Leveraging delivery of the new HTMS for an expressway in Sri Lanka, going forward MHI intends to focus efforts into sales expansion in overseas markets through proposals of traffic management system specifications and functions best suited to the situations of the emerging economies, etc. At the same time, by proposing comprehensive ITS solutions encompassing expressway toll collection and communication systems, the company aims to contribute to the realization of enhanced road traffic safety and reduced congestion, to achieve pleasant transportation environments.